Being able to identify the avian community on your property is an important step in land management. We will visit your land and conduct either a walking or driving grid survey with a basic overview of the bird species on your property or a species density survey. We can inspect your nesting boxes, feeders and water sources and advise on their placement and condition. April 1 thru mid-June is peak time for a Spring breeding survey, spotlighting our migratory birds. The remainder of the year will identify year-round resident birds. Scheduling both surveys gives the landowner insight into the abundance and diversity of total avian populations. Bird surveys fulfill one of the management practices required for TX Wildlife Management Tax Valuation. I have 20 years experience conducting Bird Surveys for submission to the county tax assessor. I am a one-man business and my pricing does not have to support the overhead of a larger company, therefore I can save you more money. Try me, I think you'll like me! Winner of Wimberley Birding Society "Golden Eagle Award" . Sandy Komito - Record holder of Big Year since 1998 - says "I've known Jesse for a number of years and his birding skills are quite impressive and make him a most qualified individual in the area of bird identification." Cecilia Riley - Executive Director of Gulf Coast Bird Observatory - "Watching Jesse grow from an avid kid birder into an honest, talented, professional has been a joy. If only other adults professing to serve conservation showed just half of Jesse’s commitment, the planet would be a healthier place –and there would be a lot more birds and birders in it!" 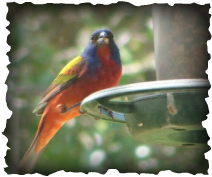 Jim & Jean M. - survey recipients - "For the past ten years Jesse Huth has provided a springtime bird count on our Wimberley property in support of our Wildlife Management plan and report. Each year he did an early morning and late afternoon/evening tour of our property. Jesse has amazing skills and was able to identify birds by both sight and sound. After we developed a small water feature on our property, Jessie noted a dramatic increase in the number of species of warblers visiting that location. We would recommend Jesse to anyone desiring a competent bird survey on their property." Other testimonials available upon request.